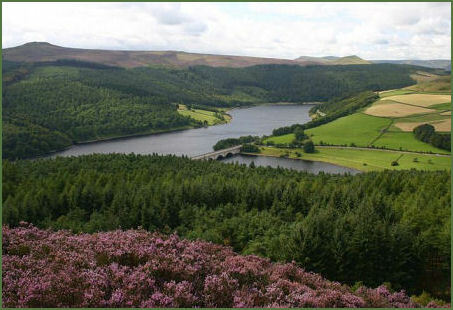 A deep valley surrounded by gritstone edges, it has three reservoirs, the Ladybower Reservoir, (pictured below left) which is situated to the south of the valley, the centrally placed Derwent Reservoir and the Y shaped Howden Reservoir to the north (pictured opposite right). Two Gothic-style dams were built across the River Derwent to create Howden Reservoir in 1912 and Derwent Reservoir in 1916. West of the Derwent a large village of corrugated iron homes, called Birchinlee, but known locally known as 'Tin Town', was created for the workers emplyed to build the dams, many of whom came from the Elan Valley Reservoirs in Wales. The village was dismantled on completion of the dams. The larger Ladybower Reservoir was mainly constructed during World War II, the villages of Derwent and Ashopton were flooded, despite much controversy and their occupants relocated to the Yorkshire Bridge estate, further downstream. An historic seventeenth century packhorse bridge which once stood in Derwent village was dismantled and re-erected at Slippery Stones, just to the north of Howden Reservoir. Unlike the upper dams which are constructed of masonry, the Ladybower Reservoir dam is an earth embankment with a clay core. This third dam was opened by King George VI in 1943. Derwent village can still be seen during droughts and the spire of the village church was visible until 1959, when it was finally demolished. 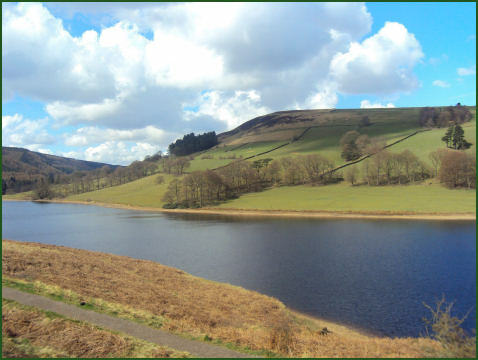 Together Howden, Derwent and Ladybower reservoirs form the largest area of open water in the Peak District National Park. 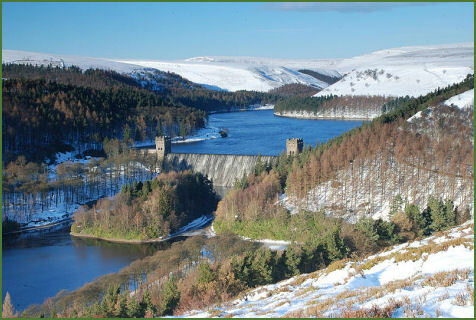 The three Derwent Valley Dams are famous for the Dambuster training runs during the Second World War. The dams were used as a practice environment fo low level flying techniques by the Lancaster bombers of the 617 Dam Busters Squadron in 1943 prior to their attack on the Ruhr dams. The Upper Derwent Valley dams were chosen due to their similarity to the Möhne and Eder dams in the industrial heart of Germany. 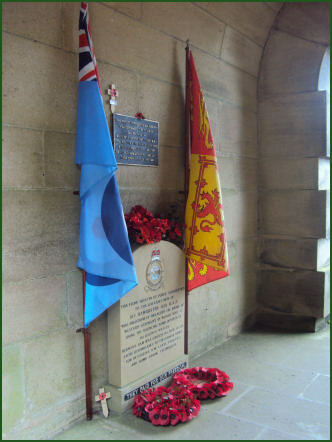 A memorial to the Dambusters may be seen at the West Tower of the Derwent Dam. (pictured right) The tower houses the Derwent Dam (617 Squadron) Museum which contains a collection of memorabilia dedicated to the famous Dams Raid. The museum includes photographs and other material covering all aspects of the Dams Raid, including details of the training flights carried out by 617 Squadron over the Derwent Dam and material relating to the film “The Dambusters”. There is also an example of the famous “Bouncing Bomb”, which forms the centrepiece of the museum’s display. A road winds up the left side of the Ladybower, Derwent and Howden Reservoirs for nearly 8 miles to a turnaround at King’s Tree. The area is extremely popular walkers, cyclists, birdwatchers and fishermen, to preserve the tranquility of the valley, which attracts over two million visitors every year, the Peak National Park Authority now close the road beyond Fairholmes at weekends. 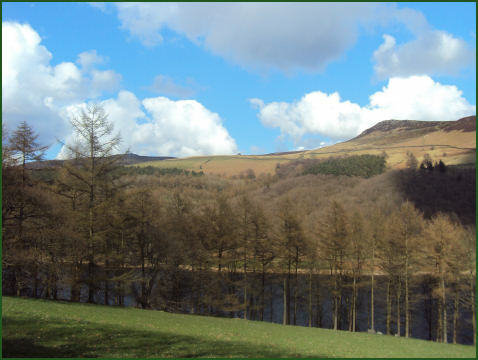 The Fairholmes visitors' centre is located at the northern tip of Ladybower Reservoir. Information is available in several of formats, including books, leaflets, guides and 3D models. There are interesting old photographs showing the villages of Derwent and Ashopton before they were flooded during the dams construction. There are three small walks of different distances near to the visitors centre, all colour coded and signposted. Teas, coffees, drinks, ice creams and snacks are also available. There are three small walks of different distances near to the visitors centre, all colour coded and signposted. The valley today presents as an attractive mix of large stretches of water and woodland surrounded by high moorland. The valley sides are mainly clothed with larch, spruce and pine, with some remnants of old oak woodlands. Wildlife includes red grouse, mountain hare and golden plover. There are 3 car parks along the way before you reach Fairholmes Visitor centre as well as a larger one at the centre itself which is pay and display. The Derwent Valley Heritage Way runs for a distance of 55 miles and is way-marked with small yellow and purple disks. The route commences close to Ladybower Reservoir, and follows the course of the River Derwent passing historic Chatsworth House and through the Derwent Valley Mills World Heritage Site, through the superb scenery of the Derbyshire Dales, to its end point at the confluence of the Trent and Mersey Canal, the River Derwent and the River Trent.